Vancouver mayoral candidate Kennedy Stewart pleaded guilty to one count of criminal contempt in B.C. Supreme Court on Monday. 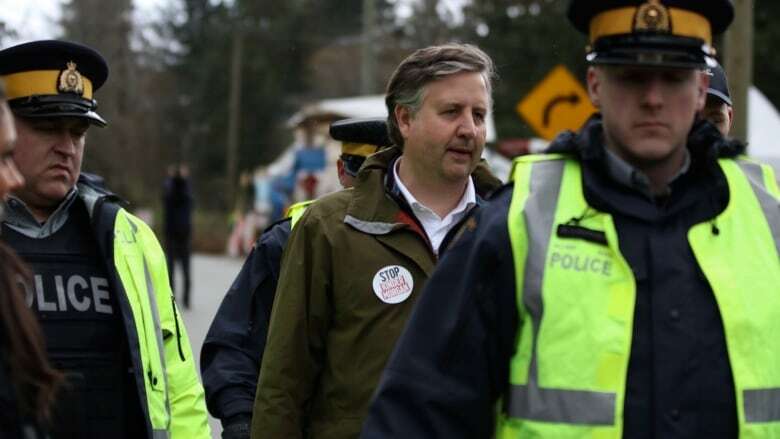 Stewart, who is stepping down as member of parliament for Burnaby South, was arrested peacefully March 23 while protesting the Trans Mountain pipeline expansion project at Kinder Morgan's Burnaby terminal. Stewart was among a group of protesters, including federal Green Party Leader Elizabeth May, who blocked access to the company's main access gate, violating a court order to stay at least five metres away from company work sites. A special prosecutor for the province has called for a $500 fine to be levied, which Stewart says he will pay by Friday. B.C. Supreme Court Justice Kenneth Affleck said this is not a criminal code offence, but in "normal" cases it could carry higher fines. Stewart and May were initially charged with civil contempt. "I take full responsibility for my actions," said Stewart outside court. "But I will continue to push to stop this pipeline, which I think is a very bad project." Despite the name of the charge, criminal contempt is not a criminal code offence and Stewart will not have a criminal record. Stewart's counsel Richard Fowler told the court that sometimes civil disobedience plays a role in a healthy democracy. On May 5, the two-term NDP MP announced he would be resigning his seat in parliament to run as an independent for mayor of Vancouver. May, who was charged on the same day as Stewart, is set to appear in court on May 28. With files from Yvette Brend. An earlier version of this story referred to Kennedy Stewart as the former MP for Burnaby South. In fact, he remains an MP and has only announced his intention to step down.